Fri., April 19, 8-11 p.m. and Fri., April 26, 8-11 p.m. The Rusty Pieces bring their well crafted original soulful stomp, shake, strum, and bang sound to Mesquite Chop House in Southaven. 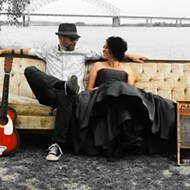 Come check out the unique sounds of this original Memphis band as they blend guitars, bass, harmonies, stompbox, washboard, cajon, harmonica, shakers, tambourines and lush harmonies.